Before the Anthology series and before the internet laid waste to the term "rare," albums like this were a fan's dream. While I'm sure there were bootlegged versions of these songs floating around (and I think some of them just hadn't been released in the US), nothing compares to a solid official release. The sound quality is guaranteed to be better, and in this case you even get some fairly detailed liner notes. To the casual fan, this might not have a ton to offer, as some of the tracks are just alternate mono or stereo mixes (depending on which format the original track was offered) or versions where a different vocal take was used. The obvious exception here is "Sie Liebt Dich," which is "She Loves You" sung completely (and very convincingly) in German. 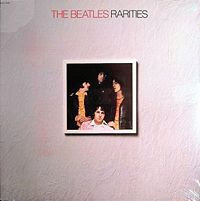 But, they also do some strange combining of rare versions to form completely new tracks, and with the Beatles, the difference between a mono and stereo mix is huge, so it does make some of the cuts seem like new songs. The liner notes are key, as they let you know which aspects of the song to concentrate on. Sometimes it's fairly obvious, as with "Helter Skelter," where Paul's vocals sound completely different, or "I'm Only Sleeping" which finds the verses in a different order than the original. Overall, this collection does its duty: It's chronological, detailed, includes some rare photos (the gatefold opens to reveal the infamous "Butcher Cover"), and doesn't waste any space. It's really everything a good rarities collection should be. Looking at it now, I'm realizing it seems like a mini version of the Anthology series. It's records like this I can point to if anyone asks me why I still own a turntable. It's never been released on CD, and it makes for a great read and a great listen. You can't download that sort of thing, people!